I've learned quite a lot about pruning this semester, and so I am slowly pruning all of my smaller trees, including the Chinese pistache (Pistachia chinensis). We have four of them, and they are in a location that is great, soil-and-climate-wise, but the space is a little too small. I underestimated their mature size, though they don't get all that large - 30 feet tall, with a similar spread. A nice compact tree, really. But I have four of them in a narrow space, and they are now quite crowded. Rather than remove them and start again with a smaller species, I thought I'd try to work it out by reducing several of the large branches and the leader. I think they will respond well to the pruning and be just fine, but honestly, I should have chosen different trees for this space. Live and learn. Anyway, this pruning is providing me with a lot of wood for both garden and home uses. The larger pieces will be sawed into lengths suitable for the outdoor firepit; they will stay in a pile against the fence as they season and dry, and meanwhile be habitat for all sorts of creatures (I'm still trying to attract snakes!). 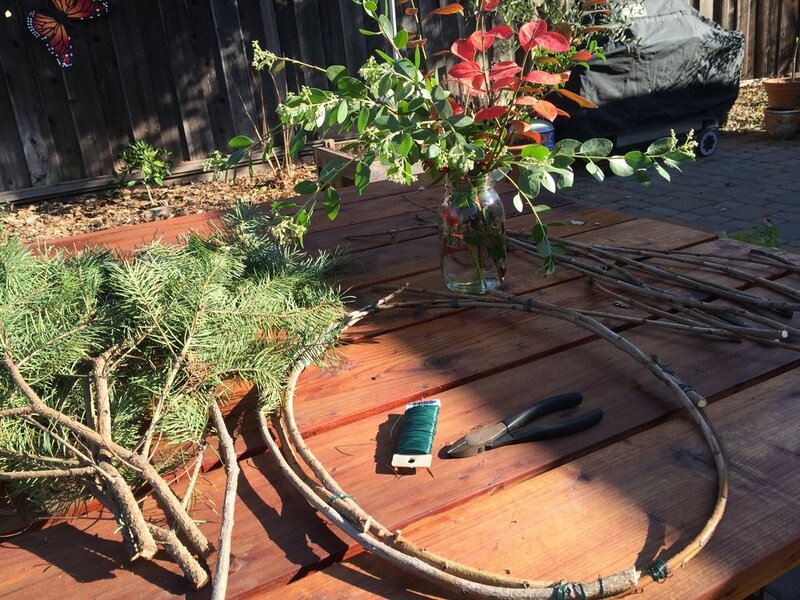 However, the thin, flexible branches looked just right for making a wreath. I think the last time I made a wreath I was ten years old and it was a family project. I have absolutely no idea what I'm doing. But I just couldn't let this wood go to waste, and the cost was very minimal. This was a low-stakes project. I just had to buy 22-gauge floral wire, which is only a couple of bucks. Some wire clippers scavenged from Tom's tool bench, and I was ready to go. 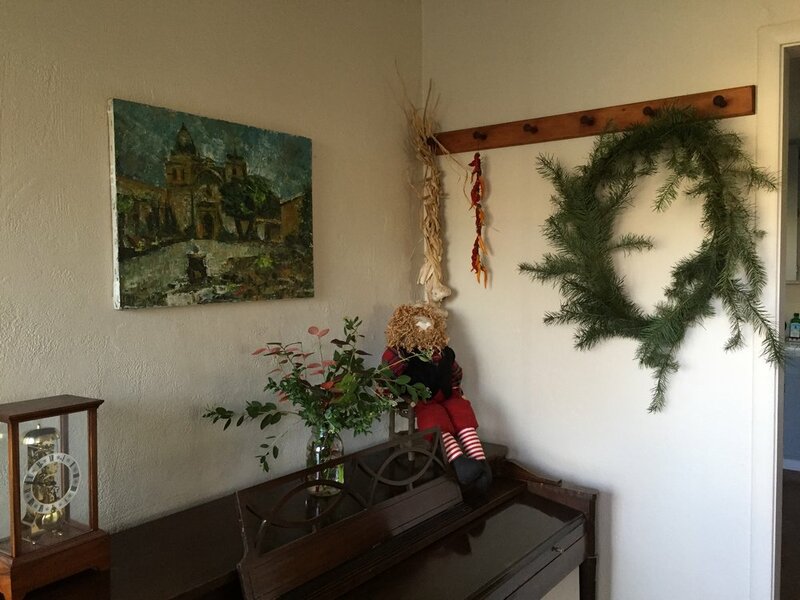 I also had greenery left from trimming the bottom of the Christmas tree, plus some beautiful branches from the yard. I had to cut these blueberry, huckleberry, and manzanita branches for a class presentation, and they are so beautiful that we've been enjoying them in a bouquet inside for several days. I thought I might add them to the wreath, but as it happened, I liked the look of just plain pine greenery and decided to leave those branches in their mason jar. But, you could add anything you want. Toyon berries, or whole lemons, or narcissus in those tiny plastic jars of water - practically anything could be tucked into this wreath. And in fact, I intend to change out the greenery with the seasons, or perhaps every month, if I'm really motivated. This wood frame that I wove should last for years. I just bent the branches into the shapes I wanted, and then wired them in place together. I made a sort of long, thin oval, but you could do a perfect circle if you prefer. I imagine it might be determined by your branches and their natural shape and flexibility. I added branches, about four thick on every side, securing them with the floral wire, until I felt the frame was secure. 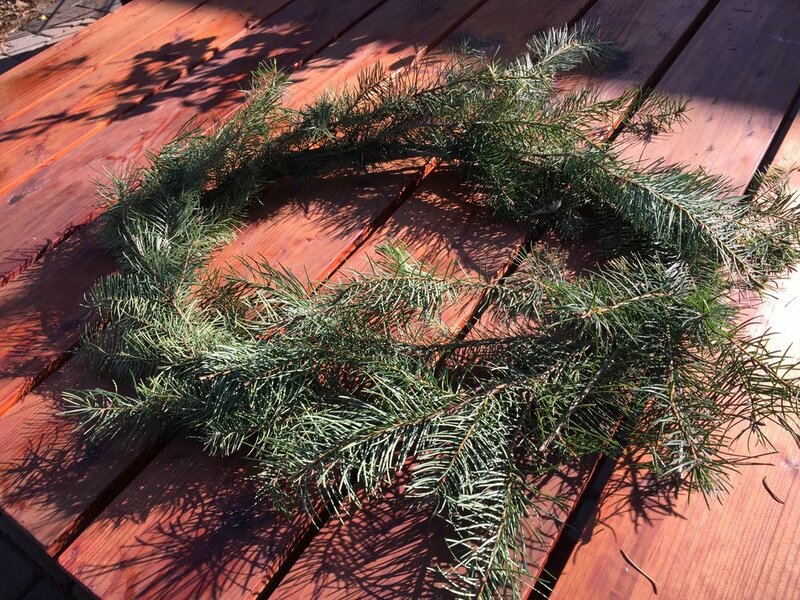 Then, I worked with the pine branches, adding them in, and hiding the floral wire with the next branch of greenery. It took less than an hour to complete, and I love its free-form, wispy look. You could make a more formal wreath by tucking in all the spare ends, or you could make it really thick; frankly your only limit is the available materials, and your imagination. I'll try to remember to post pictures every time I change out the greenery on this wreath. I think in January, I will try to make a wreath completely full of different berries found on my walks, and maybe some acacia blooms.